Presidential Debates: Can't We Do Better? Scorn has been heaped on ABC News anchors Charles Gibson and George Stephanopoulos for their work on this week's debate between Democratic presidential contenders Hillary Clinton and Barack Obama. Obama, his supporters, and some pundits have been critical of the two for using more than half of the debate to pose what they regard as "gotcha" questions, rather than ones dealing with substantive issues. Stephanopoulos defended the approach taken by he and Gibson, saying, "We wanted to focus at first on the issues that were not focused on during the last debates." The "last debates" includes a body of twenty, count 'em twenty, previous encounters involving the two senators! By this time, we've probably all heard what the two senators have to say about the biggest issues of the campaign--from Iraq to the economy, health care to special interests' influence on public policy. In fairness to Gibson and Stephanopoulos then, a different approach was warranted. They're news people and it's legitimate for them to look for the candidates to "make news" by being forced to answer different questions. And, it probably would have been unnatural to expect that in the wake of some of the comments and gaffes perpetrated by the candidates and their respective campaigns that there wouldn't have been some questions about their alleged elitism (Obama) or distance from the truth (Clinton). But, it seems to me that Gibson and Stephanopoulos also missed a golden opportunity. "Senators, we've heard where you stand on some of the marquee issues," they might have said, "but how about if we spend some time on other issues the lay beneath the surface?" For example, time might have profitably been spent on discussing the interrelated issues of suburban sprawl, white flight, energy costs and alternative energy development, and how the US can be a leader of Third Wave economic pursuits while still maintaining its agricultural and industrial bases. Or, given the candidates' critiques of current policy in Iraq, they might have been asked about the disintegration of realpolitik as a guiding principle for foreign policy in both parties and whether today the only alternatives are Wilsonian interventionism and isolationism. Prior to one recent debate, I suggested 23 questions that might be posed to the candidates. Most of the topics I thought worthy of exploration were ignored. There are too many debates and presidential campaigns are way too long. Those two facts no doubt play their part in yielding insubstantial "debates." But if the two ABC anchors were serious about focusing on issues not focused on in previous debate encounters, they could have done a lot better job than they did this week. A busy life has prevented me from completing my series on Jeremiah Wright's public pronouncements. But maybe enough has already been said here on the topic. I've tried to be fair to Wright, who I believe has been a faithful Christian pastor for many decades, but who has also displayed a disturbing tendency toward antisemitism and what I regard as overpoliticization of the Gospel. I also find his willingness to embrace and applaud the bigoted Louis Farrakhan incomprehensible. However, for the last word on Wright, I would point you to the fair-minded words of Pastor John Buchanan, editor of Christian Century. You'll find Buchanan's thoughts here. Almighty God, your Son Jesus Christ is the way, the truth, and the life. Give us grace to love one another, to follow in the way of his commandments, and to share his risen life with all the world, for he lives and reigns with you and the Holy Spirit, one God, now and forever. 1. Each of the texts appointed for this coming Sunday are so rich and so deserving of explanation that I'm tempted to preach on all of them. But we don't have that much time together in worship! 2. The texts, as usual, are interrelated. Psalm 31 is quoted by Stephen in the Acts text. (He emulates Jesus in doing so. More on that momentarily.) Peter speaks of believers in Christ being built into the household of God and in the Gospel lesson, Jesus talks about preparing a place for us with the Father and Him, Who are one. 3. Please take a look at the comments of Chris Haslam for a good overview of all the texts. See here. 4. In Acts, in the chapter preceding our lesson, Stephen has made the argument that Jesus is the fulfillment of Israel's history, law, and prophets. Judgment is upon all, Jew and Gentile, who reject Jesus. Salvation belongs to those who trust in Him. Jesus makes the same point, but at an even deeper level, in the Gospel lesson. He and the Father are one, Jesus asserts. If you have seen Jesus, He tells the disciples, you have seen the Father. This is why Jesus is the one and only way to relationship, to eternal homing, with God the Father. Yeah, I'm prejudiced, but he's got a great blog! During yesterday's gathering of congregations from the Scioto Conference, Southern Ohio Synod, (ELCA), we heard an enlightening, if grim, presentation on domestic violence. One stunning statistic shared was that within the adult population in the US, 25% of all women and 11% of all men have been the victims of such violence. The presenters reminded us that physical violence is just one dimension, the worst perhaps, of a deeper problem that crops up in many relationships: the insistence of one person on being the boss and the acceptance of that by the other. Often in abusive relationships, one partner, more frequently the man, convinces the other that no one else would have them. Sadly, as the speakers pointed out, abused people are encouraged to stay in relationships because they think the relationship's problems are their fault or because they want to keep their marriage or family intact. As I reflected on the presentation, I grasped that this is a profoundly spiritual issue. People who feel the need to be "boss," dominating their relationships, are compensating for a deep sense of fear and inadequacy. Such feelings can only be increased in economic down times, such as the ones through which we're going right now. Abusers feel that life and the world are out of control. And so, they seek to control those around them. People who submit to abuse are also wrestling with fear and inadequacy, willing to accept abuse--verbal and emotional as well as physical--as the price they must pay for having what they mistakenly believe is "love." In essence, abusers make themselves gods to those they abuse and those who accept their abuse offer a twisted kind of "worship," allowing their abusers control over them. Of course, as Christians, we pray, "Your will be done," believing that life is best when God is in control and when we place ourselves under His authority. People need to hear and experience the Good News of God, Who is for us, promises to be with us through good and bad times, and to hear our prayers. The author Flannery O’Connor once told a story which I first read in a retelling by the late Lutheran theologian, Joseph Sittler. Sittler loved it and after retelling it, reflected on its meaning. It’s the story of an elderly couple who lived in the Appalachians, surrounded by breathtaking views. They were accustomed to sitting in rocking chairs on the front porch of their home for as long as the weather allowed, simply taking in the same sights they’d seen hundreds of days before in their long married life. They say that familarity breeds contempt. It can also breed indifference. But if we let it, as was true of this old couple, familiarity can also breed things that are wonderful--”breathtaking,” as Sittler puts it—things like comfort, confidence, and assurance. One of the most familiar chapters in the entire Bible is Psalm 23. To prove it, I’ll recite the first clause of a phrase from the psalm and out loud, you finish it. “The Lord is my shepherd....” “He makes me lie down in...” “Even though I walk through the valley of...” “Surely goodness and mercy shall...” You see, you are familiar with Psalm 23! And yet, I wonder if our familiarity with Psalm 23 and with the entire Bible from which it comes has bred in us not comfort, confidence, and assurance, as it should do, but indifference? In fact, I wonder if the same thing couldn’t be said of our attitude toward the whole Bible. Almost everybody owns a Bible. But not many of us read it, digest it, study it, absorb it, or give it a central place in our lives. I struggle to do this myself. We don’t, I suspect, allow the Bible the time it needs to help us know the God Who wants to be our good shepherd or to teach us what difference that makes. If we did, more churches would be more vibrant centers of mission. More of we Christians would be making sounder decisions about our lives. More of us would be loving and serving our neighbors. More of us would be engaged in ministries, serving Christ through our churches. And more of us would be inviting others to worship and to know and follow Jesus Christ. Authentic faith, faith that helps us face everyday living and gives us hope forever, is strengthened when we live under the power of God's Word. Folks, I don’t mean to be flippant, but to be quite honest with you, I don’t know if God much cares who the next bishop of the Southern Ohio Synod, who we are to elect next month, will be. Speaking personally, all I expect from a bishop and bishop’s staff is that they assist congregations, which are on the frontlines of Christ’s mission for the Church, through their transition times and that they work to ensure that the ELCA neither embarrasses congregations or gets in the way of their primary mission, making disciples. Those are tall enough orders in themselves. But the documents of the ELCA and our synod mandate page after page of work to be directed by the bishop. For all that though, I think that congregations led by faithful pastors will keep on doing the work of the Church no matter who our next bishop is. Or whether we even have a bishop. But of this I am certain: Unless the Church—congregations, pastors, bishops, janitors, and physicists—unless the whole Church is attentive to God’s Word—the Word as it meets water, bread, and wine in the Sacraments, the Word as lived out when we serve others in Jesus’ Name, the Word as we share it when we invite our spiritually disconnected friends and neighbors to follow Christ with us, the Word as proclaimed by faithful preachers, and most importantly, the Word in Scripture, the authoritative source and norm of our life, faith, and practice—unless the Word of God is central to our life as a Church, we will be impotent in dealing with the real-life issues that face people in our parishes. Only the Spirit-empowered Word of God—Law and Gospel—will enable us to help people dealing with things like domestic violence, relational discord, and all the other sin-rooted maladies that afflict us and our neighbors. It is the Word that convicts us of our sin and our need of a Savior. It is the Word that shows us that the crucified and risen Jesus is that Savior Who will never abandon His people and is preparing a place for us with Him in eternity. “The Lord is our shepherd. We shall not want.” People steeped in God’s Word know that! Christians who don’t regularly attend to God’s Word are setting themselves up for disaster. So are church bodies. We live in an imperfect world. Bad things happen. Temptations come to us. Accidents and disease may come to us. If we’re not steeped in God’s Word, life will knock us flat. In a way, the message of the whole Bible is summed up well in Psalm 23. Psalm 23 tells us five important things about God, our good shepherd: God provides for us; God He allows us to be at ease, confident that if we will let Him into our lives, He’s with us no matter what; that God gives us life; that God stands with us in dark times, even when we die; and God welcomes us to be with Him always. Let me tell you a true story. Shortly after I learned how to ride a bicycle, I begged my Mom to send me on errands to Gus’ IGA near the corner of Central and Sullivant Avenues in the section of Columbus called the Bottoms, where we lived. I had a twenty-four inch, beat-up blue Schwinn bike. I’d grown tired of using it to tool around the neighborhood or the blacktop in front of the warehouse behind our place. Besides, Gus had a daughter named Mary Ann and she made my eight year old heart go pitter-pat. My mother was resistant to the idea. Sullivant and Central were busy thoroughfares. But one day she started to fix Johnny Marzetti and realized she didn’t have a key ingredient: canned tomatoes. My two year old sister Kathy needed attending. So, Mom sent me to Gus’ for the tomatoes. When she called me in from playing baseball in the alley, I was psyched! Here was an important errand I could run on my own...and I might get to see Mary Ann in the bargain. “Remember, sliced tomatoes in the can,” my mother called out to me as I pedaled off. By the time I got to Gus’ five minutes later, I had forgotten what I was supposed to buy. I had to ask Gus to dial my home number, so that I could ask Mom to repeat her order. After I got off the phone and had paid for the tomatoes, I asked where Mary Ann was and learned she wasn’t even around. On the way home, I decided to take an alley that rolled steeply to my street. I rolled down that hill without looking to my right or left. A car came along just as I approached the end of the hill. Boom! I hit the car’s side. Fortunately, neither I nor the car were hurt. Now, here’s the point: In the blink of an eye, I had forgotten that I was supposed to get tomatoes. I’d forgotten that I should look both ways when turning onto a street. I’d even forgotten, apparently, how to use my brakes. I was so consumed with thoughts of being a big shot and of seeing Mary Ann that the important things I knew and needed to remember got crowded out of my brain. The same thing can happen to you and me when it comes to the most important thing in the world, our relationship with Jesus Christ, both as a church and as individual Christians. We can become so consumed with everyday life that we forget our Good Shepherd and our daily need of Him. Our attentiveness to God's Word is what God uses to daily remind us to keep building our lives on Him and His promises. It would be a shame if the Church of Luther and Melanchthon and the Reformation forgot that. God’s Word is our great heritage. On its pages, we’re reminded again of the truth we must never grow tired of remembering: The Lord is our shepherd. We shall not want. He makes us lie down in green pastures. He leads us beside still waters. He leads us in right paths for His Name’s sake. I saw video clips of a world-famous talk show host this past week. Her initials are Oprah Winfrey. In these clips, Winfrey, who seems like a nice person, was holding forth on spiritual issues. She said, for example, that sin doesn’t exist. She also claimed, several times in several ways, that all religions and spiritual quests may lead people to God. Is that true? Well, not according to Jesus. And in today’s Gospel lesson, Jesus uses two illustrations to point us to Who He is and to the relationship with God that you and I…and every person on the planet…can have through Him. But only through Him. Jesus calls Himself a shepherd and a gate. More on that in a moment. First though, we must establish the context for these illustrations. How is it that Jesus came to speak the words we find in John 10:1-10? It all started when Jesus gave sight to a blind man in John 9. It aroused controversy because Jesus had the temerity to do the loving will of God on a Sabbath day. The Pharisees accused Jesus of doing work when He shouldn’t have. It made them so angry when the blind man declared that Jesus, in spite of this Sabbath violation, must be from God. It made them so mad, in fact, that they excommunicated the guy. Now, at one level, the Pharisees were nothing like Oprah Winfrey. Unlike Oprah, who seems to say that any religious belief will get you to God, the Pharisees believed that only by abiding by their extensive lists of religious rules could one be right with God. They differed in other ways as well. But, based on both the Old and New Testaments, both Winfrey and the Pharisees have one big thing in common. They are equally wrong. Over the centuries, starting with a desert people to whom God gave a land and a promise that they would become a light to all the nations, through the birth, life, death, and resurrection of a Man Who showed Himself to be God in the flesh, God has revealed Himself and His plan for the human race. From the beginning, the plan for a right relationship with God and for a life with Him that lasts forever has been the same. We are simply to believe in Him and only in Him. Genesis says that Abraham, the patriarch of Biblical faith, believed in God and God’s promises and that God “reckoned it to him as righteousness.” Abraham was right with God through belief in God. Now, the New Testament book of Hebrews tells us, God has revealed Himself in Jesus. All who turn from sin and believe in Him have the same blessings enjoyed by Abraham, rightness with God and life in His Name. It isn’t because God is an egomaniac or because God wants to establish an exclusive club that the first commandment is, “You shall have no other gods.” It’s that God wants to give us life and only He can give it. All other roads are dead ends, literally. In the words of our lesson for today, Jesus is trying to convey this truth to the Pharisees and others who may be listening to Him, the truth that salvation comes to those with faith in the God revealed to Israel and ultimately, in Him. The one who enters by the gate is the shepherd of the sheep. The gatekeeper opens the gate for him, and the sheep hear his voice. He calls his own sheep by name and leads them out. 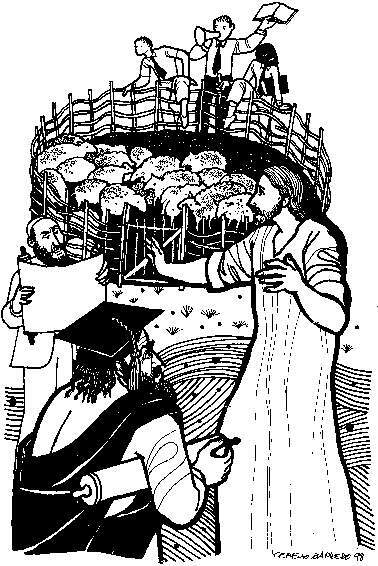 When he has brought out all his own, he goes ahead of them, and the sheep follow him because they know his voice. They will not follow a stranger, but they will run from him because they do not know the voice of strangers. Sheep are pretty dumb creatures, I’m told. But if a stranger comes among them, they will en masse, move away, alarmed. Once a person familiar to them shows up, they relax, knowing that this person won’t lead them astray. They respond to the voice of the shepherd who takes care of them. We may be brighter than sheep. But it's not that different for us. Have you ever noticed how you can hear the voice of someone with whom you’re close even in a crowded, noisy place? Both of our kids were in a 100-plus-voice choir in high school. I can remember when we accompanied the kids on a concert tour in England. I particularly remember listening to them during a performance in the Milennium Dome in London. Like all parents, Ann and I found that if we perked our ears just right, we could hear both of our children’s voices in the midst of the others. You can dial into the voices of those you love and those you know love you. Jesus is the gate to eternity. Years ago, Ann and I went to a Halloween costume party. She went as a man, coat and tie and Mascara beard. It was the era of the first Battlestar Gallactica the sci-fi series on TV. So, I went as some interplanetary character, my costume composed of a Hefty bag around my torso, cinctured at the waist by a wide cloth belt, and…I hate to admit it…leotards. Leotards! Now, if you made a list of the worst time for us to forget our house keys, this particular night would have been it. But, of course, we did lose our house keys and when we got home, struggled to find a way to get into the place. Picture this, folks: Ann is in drag and I’m in leotards. Leotards! We began working our way around the first floor of the place, trying every window. Finally, on one side of the house, I stretched up and could tell that one of the dining room windows, which set about 7-feet off the ground, was slightly ajar. If I could hoist myself up, I might be able to slide the window open, throw myself into the house, and let Ann in. The previous occupants had left behind half of an old pickle barrel they'd used as a planter. It wasn’t very big. But by standing on it and letting Ann push me from behind, I was able to throw myself through the window. I was halfway into the house, my hosed-legs still hanging outside, Ann no longer able to help me, when a thought crossed my mind: How would I explain this to a passing cop? You see, if you belong somewhere, you don’t have to break in. You go through the front door. Some people think that getting to God happens as the result of a long spiritual quest. The Christian life does have its challenges. Belonging to Jesus doesn’t insulate us from the difficulties of this life, for example. And sometimes, as our second lesson for today points out, we face rejection precisely because we follow Jesus. That’s why I hope that every member of Saint Matthew will not only regularly worship and receive the Body and Blood of our Lord, but also get involved in a Bible study, whether in Sunday School or the next offering of the Witnesses for Christ class or the WELCA group. I also hope that we’ll all make prayer a daily priority and that you’ll choose to participate in the upcoming Pentecost Prayer Vigil, when we’ll invite Jesus to enter even more deeply into our life as a church.